The program will bid and play the other three hands with scoring to rubber. The random deal engine will produce an unlimited variety of hands. Written in the C++ language with direct access to the Xlib primitives for speed and compatibility, the program will work on most distributions without additional downloads. The download is a tar zip file. It contains a single executable and a readme file. Just right click the tar zip and select 'Extract here'. To play, double click the XBridge program file in the extraction folder. $14.99 Includes CD (with electronic manual) and shipping. The user may skip to a new deal at any time or replay the existing hand at any stage. The hand may also be revolved. All hands may be displayed at any stage, a summary of bids is also available. Additionally each of the other hands may be permanently displayed.The program will allow a choice of bidding speed and can also provide simple animation of the play of the cards. The program supports the ACOL bidding system with separate toggle settings for conventions for both North South and East West. The settings are retained between sessions. Stayman, Baron, Jacoby, Gambling, Blackwood and Gerber. The program is suitable for casual play and practise. 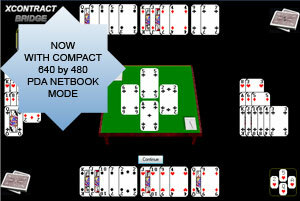 The Bridge engine utilized has been proven on several other platforms (including Colossus Bridge for Windows) and provides a interesting game but is not suitable for strong club players. A minimum display of 640 by 480 is required. If available the program will display at 800 by 600. The program has a fixed size display window. What distributions will it work on? The development was aimed at reducing the dependencies and allowing use on the widest variety of Linux platforms. To that end it utilizes the low level Xlib library to directly work with the X Server. It has been tested on Fedora Core, SUSE, Mandrake and others. No installation is required, a single executable file is supplied.